So nice to have another weekend with perfect weather. Two weekends ago, it was the same way. I could get used to this. This trip was planned by my wife Leesa, who needed Seward for her ADK 46 High Peaks. She wanted to approach Seward via the Ward Brook herd path, then descend via the Calkins Brook herd path. That was fine with me. Any hike in the high peaks is a good hike, and I had not been on the Ward Brook herd path before. I had heard nasty things about it, but we both wanted to experience it for ourselves. We overslept a little and didn't get on the trail until about 8:15 AM. There were only 2 parking spots left in the parking lot before cars would have to spill out into the shoulder of the Corey Road. We grabbed one of the spots and got our gear together. I thought the trail to the Blueberry leanto was surprisingly dry. It's kind of a mindless, straight, flat trail and we hummed along. At the leanto, we 4 tents pitched in various locations near the leanto, and one pitched in the leanto! I always hate seeing this; it just shows a lack of common courtesy, not to mention it is against the rules. We continued past the Blueberry leanto to the first cairn on the right, marking the Ward Brook herd path. We had been hiking for 2 hours at this point. As we began our way up, we both commented that it was nice that the path followed so close to the brook. There were some locations with a fair amount of mud on the trail, but we were braced for what we thought would be something much worse. Another Ampersand picture. I snapped a lot of these! Another spot along the Ward Brook herd path. As we approached the summit of Seward, we reached the band of cliffs that guard the summit. We skirted around this and soon found ourselves on top. This marks # 42 for Leesa! We went past the wooded summit and stopped for lunch on the west facing ledge. There was a fantastic breeze all day and it felt real nice. We continued on with our planned itinerary and headed for Donaldson Mountain. In the col between the two, we ran into "Hiking Chick" and her hiking companions. Nice to meet you! She was doing the 3 Sewards. We told her to consider the Ward Brook herd path to make her trip a counter-clockwise loop instead of going back down the Calkins Brook herd path that she had used on the way up. She did just that and we saw her again back at the parking lot. She got back just after we did. We also met a lot of other great people during the day. Many of them recognized us from this blog. It was nice to meet and talk with all of you. We reached Donaldson and stopped again to soak up the perfect weather. We could have easily taken a nap up there. It was a perfect﻿ day. Alas, we had to head back. Besides, Rev can't sit still for more than a couple minutes before she begins her whimper indicating that it is time to move on. You can see from these pictures that we had lots of blue sky; just enough clouds were out to add some interest to the pictures. The top third of the Calkins Brook herd path is fairly rugged, but once below a water crossing, the path becomes quite smooth and easy to walk on. We did stop at the water crossing though to take off our boots and cool our feet off in the cold water, always a treat. Interesting sign on the Calkins Truck Road intersection with the southern most trail leading to the parking lot. We found the distance from the trailhead to the Blueberry leanto to be 5 miles... not 3.8! We found the loop to be more enjoyable than an out-and-back and we give the Ward Brook herd path a thumbs up (in good weather and dry conditions). The Sewards (and Seymour) are now done for Leesa. She has 4 left (Cliff, Redfield, Sawteeth and Couchsachraga). She wants to finish on Couch because nobody else does! Hi Mike -- Great post, as always! I'm trying to plan a hike of the three Sewards (Seymour is done). If we ascend via Calkins and head to Donaldson/Emmons first, when we return to the junction of the ridge HP and the Calkins HP, how does the mileage compare returning the way we came vs. over Seward and down the Ward Brook HP? What about the elevation gain? We'd been thinking of breaking the hike into two, like Leesa did, because we have a long drive before and after and aren't the speediest hikers, but loop hikes always appeal more than out and backs. Thanks for your help! Hi Sara. If you decide to do all 3, I would make it a loop. The distance from Seward back to the summer trailhead is almost exactly 7 miles either way. The vertical would be a little less on the Ward Brook route plus you don't have to repeat the same trail. There is quite a drop between Donaldson and Seward that you would have to do twice if you do an out and back. Good luck! i'm glad I found your website. I like the nat geo maps you post on here with the route you took. that is easy to read and very helpful for giving me ideas on trip planning. could you tell me how you mark your route on those maps - is it in a program/gps or do you edit the map? thanks!!! Thanks for reading. I've got a 2 part answer your mapping question. When I use a Nat Geo map, I just draw in my route using the tool in the software. 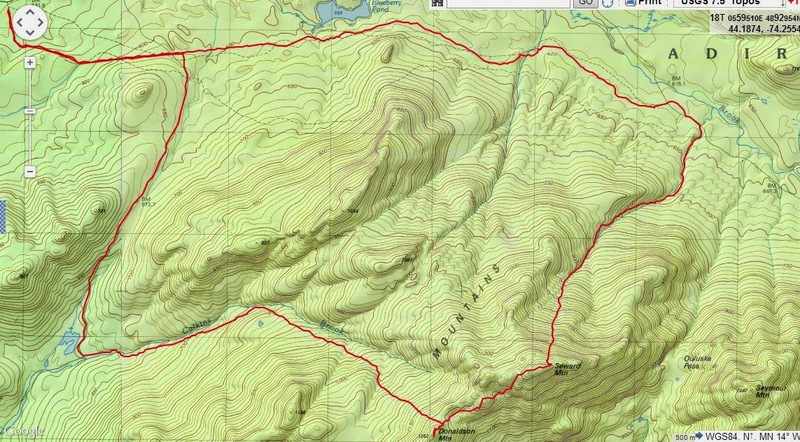 When I show a Caltopo map, I've usually imported my GPS track into Caltopo from their website. I then make a screen capture of the result to display as an image on the blog.